Gordon Rendell tells us how the Legend of Montacute has brought civic pride to the village – and a personal accolade for him after many years of promoting the Legend! I first went to Waltham Abbey in 1996 to see where the cross found on St. Michael’s Hill finished up. My attempt at arranging some Sort of Twinning with the church of the Holy Cross and St. Leonard fell on stony ground, but had better success with the Abbey Ringers, inviting them to Montacute for a ringing week-end around the area. This resulted in a reciprocal arrangement with ringers from our area going to enjoy ringing in Essex, which has continued over the years. I have been a regular attender at their celebrations on Holy Cross Day, 14th September, and as a result the event has grown to a proportion where they enact, in the Abbey, on the Saturday nearest, the finding and delivering of the cross to Waltham, to two packed audiences of school children and in the evening, a long procession with a cross, from the direction of Waltham Holy Cross, finishing with a service and a candle-lit procession around the abbey grounds. This is followed by a celebration with wine and refreshment in the Abbey. Over the years, they seem to think I am an important part of the proceedings and sit me with the Lord Lieutenant, the Bishop of Chelmsford and the Mayor; and in 2012 they presented me with a pewter Pilgrim’s Flask produced form an original 12th century stone mould which is kept in a London Museum. 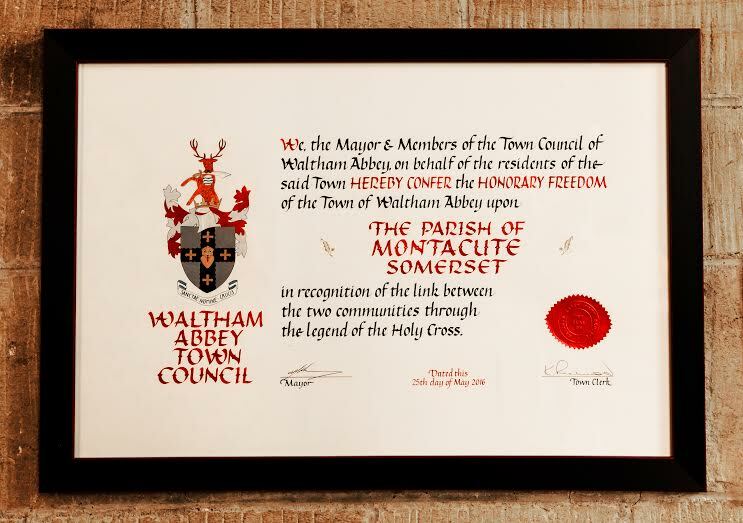 Now, this year, they asked me to contact the Chairman of the Montacute Parish Council with a view to granting us the Freedom of the Town of Waltham Abbey which we were pleased to accept on 25th May. Vincent Baker, his wife Beryl and I went to Waltham Abbey to enjoy the privilege, where we received a most warm and friendly welcome. 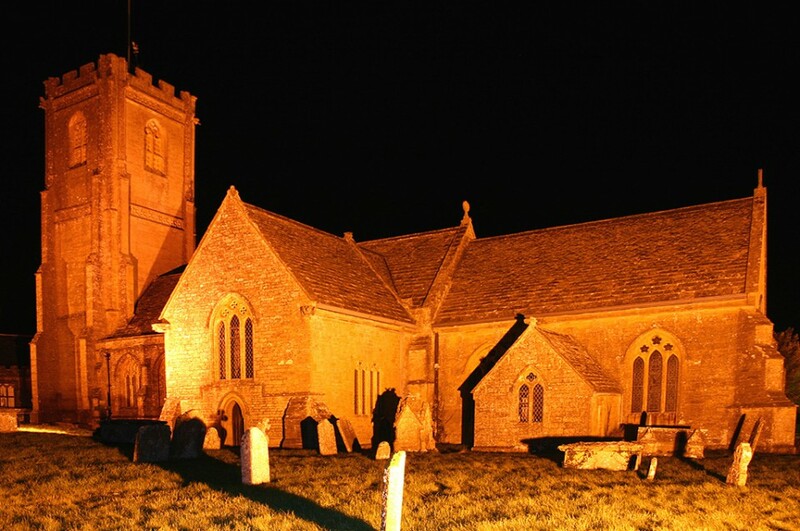 One night in the year 1035 or thereabouts, a Montacute Blacksmith, who was also the sexton of the village church, had a dream; That he should go and tell the Parish Priest that he, the priest, should go to the top of St. Michael’s hill where something was buried. In the cold light of day he decided that the dream must have been as a result of something that he had eaten for his supper and so thought no more about it. Several nights later he had the same dream again; more vivid than the time before and what was worse; an apparition that frightened him near to death visited him. Waking in a cold sweat he told his wife of the dream and said that he was going to see the priest at once. His wife was less than sympathetic and told him not to be such a fool, for if he did such a thing, he would be the laughing stock of the village. He felt that she was probably right and as he had no desire for his standing in the community to be questioned, he did nothing about it. He didn’t sleep too well for the next few nights, fearing a recurrence of his nightmare, with some justification as it happened, for back it came and this time the apparition seemed to have lost patience with him because it took hold of him and left the flesh of his arms torn. This time he dressed frantically, stopping just long enough to show his wife the marks on his arms before rushing off to wake the parish priest, who on being told of the three visitations and seeing the wounds, decided to take the whole thing seriously. All this rushing about had awakened some of the residents, who when they found that there might be something interesting about to happen, aroused most of the village. They gathered outside the church and formed a procession to walk to the top of St. Michael’s Hill. The name Montacute is derived from the Latin Mons Acutus, mount acute i.e. steep or pointed hill and as they trudged around and up the steep sides they sang a litany. There were a lot of them, and many had brought spades in the hope of finding buried treasure. So when they reached the top they began digging and it was not too long before someone uncovered a large flat stone, which they then proceeded to lift. 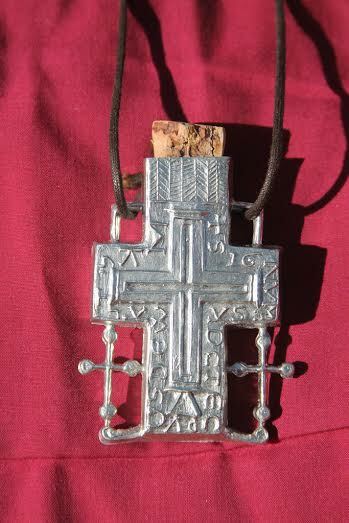 Beneath it they found a large black flint cross, finely carved with an image of Christ crucified. Under the right arm of the cross lay a smaller crucifix and beneath the other were an ancient bell and a copy of the gospels. A problem now arose, several in fact. The cross was very heavy so they would need some equipment to move it, but move it to where, and to whom did it belong ? Also it looked as if it was going to rain, so they took the bible, the bell and the small cross down to the church for safe keeping while some stayed to erect a shelter to keep the cross and the guards dry. Now who should they tell of their find ? Someone suggested Tofig, King Canute’s standard bearer, who was currently in the area, so a messenger was sent off to find him. When Tofig arrived he organised the removal of the cross from the hill and had it loaded onto a wagon together with the bell and the gospels and other ornaments and provisions for the journey. The smaller crucifix would remain in the church. Twelve red and twelve white oxen were acquired to haul the wagon, but to where ? This was difficult, where should they go ? Durham? Winchester? Glastonbury? London? Reading? These were all mentioned, but the drivers in spite of all their goading, could not persuade the oxen to move. Then Tofig thought of Waltham, in Essex, where he had already built a small house on his own estate and he promised to build a greater church there if it should so please God that the Holy Relic should be taken thence. At once the oxen moved off so easily that it appeared that the wagon was driving the oxen rather than they dragging it. It seems probable that when the oxen heard the word Waltham, they mistook it for “Walk on” which was a command with which they were familiar, and it was downhill anyway. At last it arrived at Waltham where it was set up and became the glory and the greatness of the Abbey of Waltham Holy Cross. King Harold enlarged the Abbey and the Holy Rood became the special object of his devotion and the rallying cry of his men at Senlac. Before it he knelt on his way south to fight the Norman invaders: from it he received warning of his impending doom. It became the battle cry of the English and rallied his men to make the last attack and to die in defence of the Holy Cross and their English land. Well, that’s part of the story, we know that the cross arrived in Waltham and it is recorded that Tofig’s chapel was named Holy Cross. Incidentally, at Waltham he is known as Tovi and one of his direct descendants was contacted by one Michael Zair who made a pilgrimage walk from Montacute to Waltham in October 1999. No one at present is certain of what happened to the cross, it could have been smashed at the dissolution, but in view of its previous history there is surely room for conjecture. How did it find its way to Montacute in the first place and from where ? There are those at Montacute who would suggest that it was previously held at Glastonbury and when the Danes were getting too close for comfort it was evacuated by water to a distant easily defended hill and buried there. Just such a place was at Montacute, where the Celts had built a fort and near to where the water ended. In those days the Inland Sea stretched from Glastonbury to the Priory at Stoke sub Hamdon. In fact the road leading into the village from East Stoke is still known as Sea Wall. Waltham however, say that it was sent from there in the first place and Tovi just went to Montacute to bring it back. But if there was nothing at Waltham before Tovi built his chapel, where did they get it from in the first place ? I can’t help but think that such a valuable relic would have been put in a place of safety at the first hint of anything that would have put it in jeopardy. Perhaps we are just waiting for another blacksmith when the time is right ? As always I am still the incurable romantic. Throughout the world there are many places where people have recognised a site that inspired them. A site where they felt closer to nature and the physical and spiritual worlds become as one. Usually there was a special feature, maybe an unusual rock or a spring, which acted as a focal point. Early humans used these sites to contact whatever god they worshipped at that time. Often the site would act as a teaching centre, as with Ayres’ Rock which has served the Aborigines as both church and school for thousands of years. All sites served the same purpose – a place of inspiration and worship. As man changed from hunter gatherer to farmer and grouped into settlements, there was a tendency to enclose these places of worship with wooden or stone structures, some showing amazing constructional skills and imagination. Over thousands of years, the methods of worship changed, and religion became more organised, but the sites often remained, as the new religion would occupy the same site as the old. St. Augustine actually encouraged his missionaries to use old Pagan sites, to make Christianity more acceptable to potential converts. What has this to do with Waltham Abbey, and the tourism committee in particular? I believe there is a strong case for claiming that Waltham Abbey became a religious site at least ten thousand years ago and the Spirit or Force that motivated our Stone Age ancestors is still there despite the actions of Henry the Eighth. The earliest find on the site by the Historical Society’s archaeology team, dates back to the Mesolithic period. Pottery from the Neolithic period goes back three thousand years. Roman and other remains prove the site was certainly used from AD43 until 1016 when Tovi the Proud (or Brave) appears on the scene. Tovi was the founder of Waltham Abbey, as we know it today, or Waltham as he knew it. What about the Holy Cross? The object of worship brought by oxen from Montacute (or Leodgaresburh or Lutgaresbury as it was then known, the burgh of Lutgar or Leodgar). which inspired thousands of Pilgrims. The cross that cured and inspired Harold and the thousands of men who died at Hastings with the battle cry ”HOLY CROSS”, probably their last words. The answer lies in the question. Tovi BROUGHT the Holy Cross to Waltham – to act as a focal point for the force that had existed for thousands of years and still exists today, despite the loss of the Cross. How and why did he bring the Cross, thereby creating a legend which has been accepted for almost a thousand years? A timeline will help set the scene. AD410 The Romans leave Britain enabling the Saxons to take over. The Danish Vikings are a huge problem, raiding and plundering regularly. AD680 Saxons have converted to Christianity. Bishop Mellitus builds a church in Waltham. AD865 The Danes decide to settle, mainly in Mercia, East Anglia and Essex. AD870 The Saxons from East Anglia are forced to flee to Wessex where King Alfred rules the last stronghold of resistance. They take with them their religious artefacts to hide them from the Pagan Danes. AD878 The Saxons are forced into the Somerset marshes. Alfred goes into hiding – hence the legend of the burnt cakes. Alfred raises an army and defeats the Danes at Edington. Under the subsequent treaty of Wedmore, Guthrum, the Danish King, and the Danes convert to Christianity with Alfred as Guthrum’s Godfather. The same treaty creates the Danelaw, which divides the country into two regions. This suits most Saxons other than those from East Anglia and Essex, for as one of the boundaries is the river Lea, they cannot return! AD1016 After Alfred’s death, various kings have partial control of England, until Canute (Cnut) unites the country under one ruler. He moves his court to London, where he was crowned in 1016. Tovi then appears on the scene. He is close to Canute, as his standard bearer, his friend and possibly his right hand man.